Are you looking for other ways to heat your home and avoid costly gas bills? Then the Z-MAX fireplace may be the perfect fit for you. Offering 130,000 BTUs/Hr and the ability to heat up to 3,000 square feet, the Z-MAX is Acucraft’s most efficient wood burning fireplace! The Z-MAX is also a zero-clearance fireplace, which means it can be framed with 2 x 4 construction and does not require footings. The firebox is made from heavy 7 gauge steel with all major seams being double welded inside and out. The doors are made of 1/4″ thick steel with ceramic glass for the viewing area (which radiates heat very well) and comes with a double latching door mechanism which secures the door like a vault. The Z-MAX can be operated with the door shut, the door open, or you can remove the door completely for a traditional open hearth feel (we recommend installing a firescreen for safety). If you’re looking for even more heat distribution, using Acucraft’s whole home heating technology, you can maximize your fireplace and its heating potential. 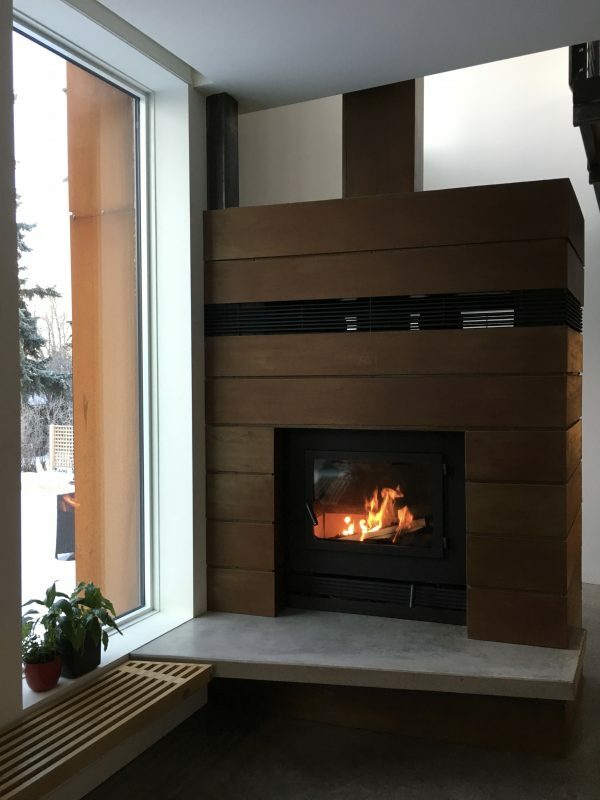 For the homeowner looking to heat their home with a wood burning fireplace, the Z-MAX is the perfect solution; it was designed & engineered to provide a long, steady, clean burn offering up to 130,000 BTUs/hr and heating up to 3,000 sq ft. Acucraft’s whole home heating system utilizes b-vent to vent heated air into other areas of your home with the goal of heating your entire home as evenly as possible & eliminating cold spots. You can vent heated air to another room on the same floor, upstairs, or even lower levels with the use of an in-line blower (different than the fireplace blower). 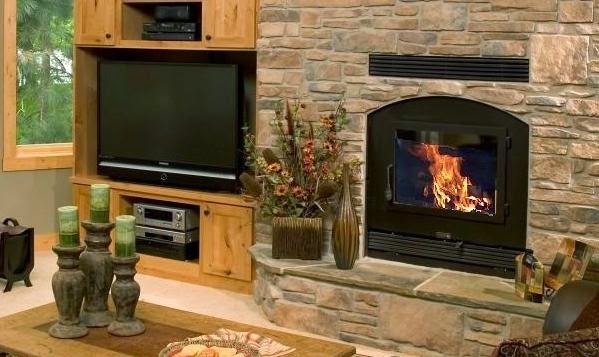 To get even more efficiency out of your wood fireplace you can connect the remote ducting system into your cold air return to evenly distribute the heated air throughout your home using your furnace fan. This diagram shows the remote ducting taking the heat from the fireplace and transferring it to the furnace for distributing the heat throughout the home using the existing ducts. Many customers opt to have the duct end at the basement ceiling, using an in-line fan you can easily control when you want heat in your basement! Firebox Lifetime Warranty: every firebox is built at the time of order, specific to the customer’s needs. Using 7 gauge steel, double welding all major seams inside & out, and heavy-duty pre-engineering components & moving parts for safe, trouble free operation. We’re confident in our products enough to give you a Lifetime Warranty on your firebox. High Quality Glass Doors: our wood fireplace doors are made with rugged 10 gauge steel, high-temperature ceramic glass, and has a dual-pin locking system (top & bottom) with full perimeter gasketing for a long-term tight seal. Versatile Open Hearth Ability: open hearth fireplaces are known to be inefficient, but Acucraft’s wood fireplaces are designed to be operated efficiently with the door closed, open or removed for more traditional ambiance. 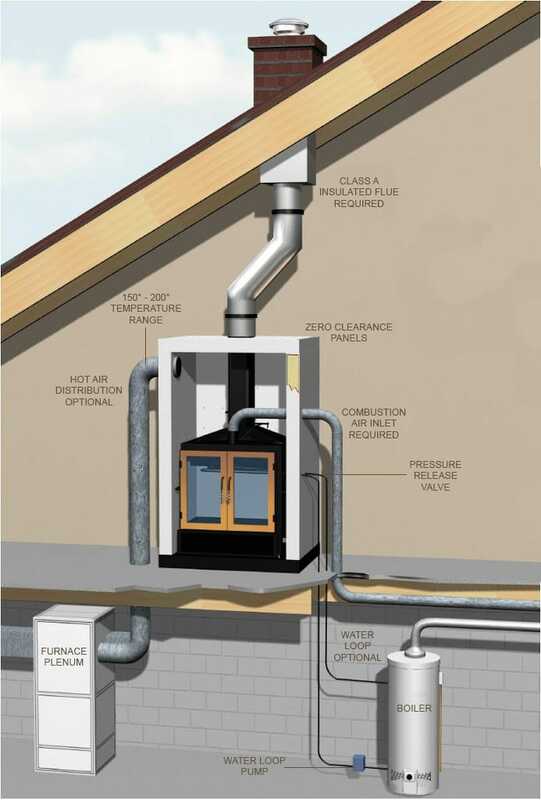 Combustion Air System: drawing air from outside your home makes our fireplaces burn more efficiently, eliminates drafts, and utilizes your heat more effectively than fireplaces that use warm indoor air for combustion. Control at Your Fingertips: every wood fireplace is designed with easy-to-use sliding draft & damper controls giving you full control over the burn rate and heat output. Firebrick Lining: rather than using a fireplace grate, we line our fireboxes with high quality firebrick that can withstand extreme temperatures and help maintain combustion & efficiency. Learn more about our Z-MAX wood fireplace by requesting a copy of our wood catalog, or speak with one of our knowledgeable Fireplace Advisors to get started today! "The fireplace is looking great. Thanks for all your hard work on this one. Came out just as we envisioned." © 2013-2018 Acucraft. All Rights Reserved.